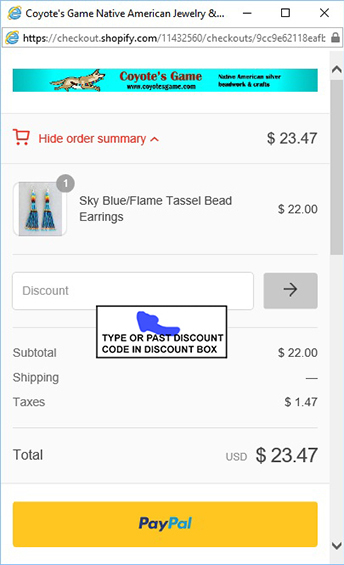 When offered, discount codes, such as "Save15" or "Take10" are shown at the top of our home page and relevant menu pages. The easiest way to enter the code is to copy and paste, but you can also type it in exactly as it appears, including capital letters and spacing. In order to get the discount for your purchase, the discount code must be entered in the shopping cart Show Order Summary page. A link to the Show Order Summary page is located at the top of the first shopping cart page displayed after you click the "Checkout" button. See image below. Clicking the "Show Order Summary" link will take you to the Order Summary page. The Discount box is the third item down on this page. Paste or type in the discount. Click on the arrow to the right of the discount box. This applies the discount. On the same page, continue through the shopping cart check out. See image below.